[SatNews] Es’hailSat, the Qatar Satellite Company, announces that Es’hail-2, the company’s second satellite, has cleared its Critical Design Review (CDR), permitting the spacecraft to move into the assembly phase and remain on schedule for a Q4 2016 launch. 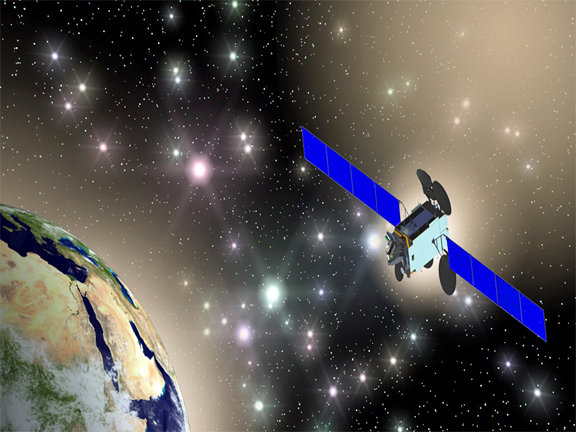 Mitsubishi Electric Company (MELCO) is building Es’hail-2, a high-performance satellite that will be positioned at the 26 degrees East hot spot position for TV broadcasting, significantly adding to the company’s ability to provide high quality, premium DTH television content across the Middle East and North Africa. Artistic rendition of Es'hailsat's Es'hail-2 satellite. Image is courtesy of Mitsubishi Electric Company. Es’hail-2 will have Ku-band and Ka-band capabilities and will provide TV distribution and government services to strategic stakeholders and commercial customers who value broadcasting and communications independence, interference resilience, quality of service and wide geographical coverage. Moreover, Es’hail-2 will provide the first Radio Amateur Satellite Corporation (AMSAT) geostationary communication capability that connects users across the visible globe in one single hop and in real-time. It will allow also the AMSAT community to validate and demonstrate their DVB standard. Es’hail-1, Qatar’s first satellite entered commercial service on Qatar National Day, 18th December 2013. Through its existing and planned satellites, Es’hailSat will broadcast diversified and high quality premium programming with anti-jamming capabilities across the MENA region. Al Jazeera and beIN SPORTS and a growing number of channels are already using Es’hail-1 capacity for high definition broadcasting of their premium content.